Hello all! It's another WIP Wednesday and I have so much progress to show. My deadline looms but the stripes keep forming. The boy was over on Monday and we ate and watched the Olympics and I knitted while we commented on the action. While appreciative of my work he doubted his own ability and coordination. He kept saying I don't know how you are doing it. Or when did you switch colors (for the stripes). It only fits on my couch now. That little blog of yellow is my sock. I put it down in favor of other Nerd Wars projects and just got back around. I have the sock done and just working on the ribbing and the bind off. I am going to attempt Jenny's Surprisingly Stretchy Bind Off. Hopefully the ladies at knit night tomorrow can get me going on the bind off. Then back to the Judy's Magic Cast On for sock number 2. After these I need to work on my superman square and something sparkly for Nerd Wars. I have to say that joining this tournament has really focused my efforts on getting stuff done. Deadlines definitely help. So how goes it for all of you? Meeting your goals? Stuck in WIP Madness? 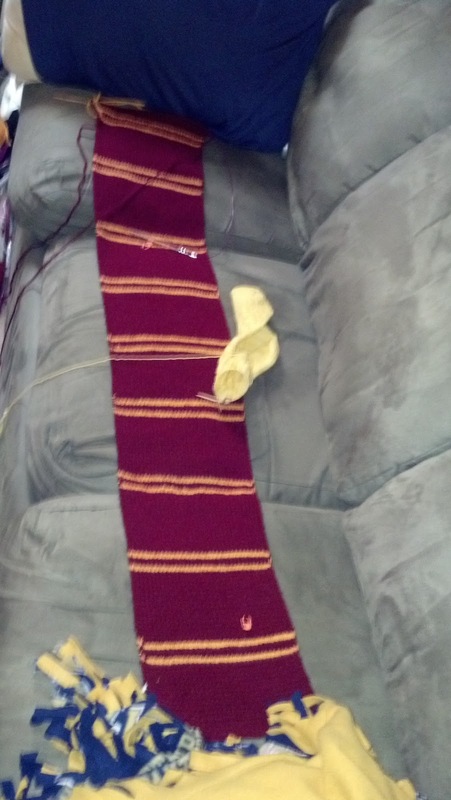 Last year my best friend told me he wanted a Gryffindor scarf. So I started knitting one then realized halfway through that I was knitting the Year 1 scared with the big stripes and that maybe he wanted the later Years one (like yours). I was relieved when he said he wanted the first one PHEW! I agree it's way less obvious of a scarf. I have a hat already done and 1 wristlet to go with it. I would make hufflepuff which wouldn't get weird looks here in steeler country. I would also make it thinner. Heehee, you two sound super cute together. 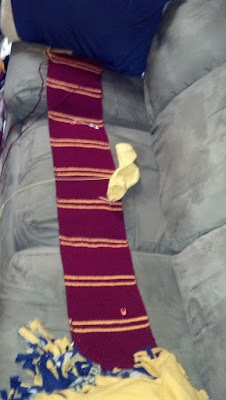 The scarf is really coming along, you are on the homestretch now! Deadlines are good things. Also, in response to your comment, my boy doesn't currently know the extent of my involvement in the fiber community, if he displays a look of absolute horror after seeing stash then I might be worried. That's a good plan. I agree the home stretch and I am starting to get sick of it. Must keep knitting. It's not really book canon but the movies switched costuming after the first 2. The first 2 were wider stripes that I feel is closer to the book but I like the collegiate look of the 3 and beyond scarf. Deadlines help. The recipient is going to college soon and I want to get it to her before she leaves. I can't join cals/kals or other tournaments because i just can't commit to getting things done!! That's understandable. I know I am motivated by deadlines or else I will just start everything and accomplish nothing. i love the Harry Potter scarf! Wowza! I am in love with your blog! You have so many things to offer! Thank you for sharing all your knitting projects! I toto am a knitter and find so much joy in it!